Primary Natural Resources petroleum, natural gas, coal. 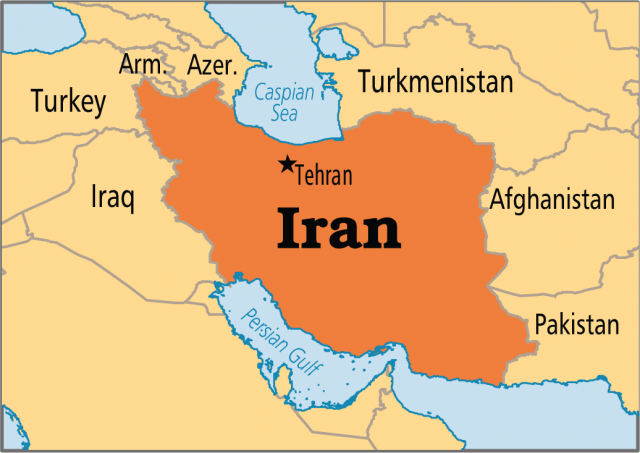 IRAN IS A MIDDLE EASTERN country, bordering the Gulf of Oman, the PERSIAN GULF, and the CASPIAN SEA, between IRAQ and PAKISTAN. Iran is a large country that is dominated by rugged mountains and large deserts. At its center is the Iranian Plateau, with great mountain ranges such as the ZAGROS in the west, the ELBURZ in the north along the Caspian Sea coast, and the mountains of Khurasan to the northeast. These mountains and the high plateau create a bowl-shaped arid expanse broken by oases that mark the ancient caravan routes. Along the Caspian coast in the north a subtropical climate exists, supporting the primary fertile region of Iran. The Iran of today stands upon an ancient base of civilization and culture. Long a crossroads for conquerors, it has been known in the West as Persia since the beginnings of historical records associated with Cyrus the Great in the 6th century B.C.E. Alexander the Great brought Hellenistic culture to Persia in the 4th century B.C.E. and opened the gate to a long procession of foreign dynasties that would rule there. Greeks, Turks, Arab-Muslims, Mongols, and Tamerlane all made their mark as centuries passed. It was during the Safayid dynasty (1502–1736) that one of the great Persian empires arose. Under Shah Abbas, the Shia branch of Islam was made predominant and the holy city of Esfahan was rebuilt as the capital. Invasion, succession of dynasties, and finally a nationalist uprising brought Iran into the 20th century. In 1925, a final dynasty was created by an army officer who had seized power and proclaimed himself shah, creating a new Pahlavi dynasty. Under Shah Reza Khan, Iran began to modernize and consolidate power as a nation-state. In 1941, during occupation of western Iran by UNITED KINGDOM and Soviet Union forces, the shah was forced to abdicate and his son Mohammad Reza Pahlavi became the new shah. At the end of World War II, allied forces were slow to withdraw, but with pressure from the UNITED STATES, Soviet forces left and the young shah reestablished his power over all Iran. He became closely aligned with the West. His pro-modernization and pro-Western stance did not hold well with the people of Iran. Over his three decades of rule, repression and economic difficulties were the norm. The shah fled the country and an exiled religious leader, Ayatollah Ruhollah Khomeini, returned to witness a popular Islamic revolution sweep the country. The United States had long supported the now-shunned Shah Pahlavi and was associated with the feared and hated secret police, the SAVAK. In 1979, the U.S. embassy in Tehran was seized and the embassy personnel were held hostage for over a year. Conservative clerical forces established a theocratic government within an Islamic republic. Soon after Ayatollah Khomeini’s return and rise as Iran’s religious leader, neighboring Iraq invaded Iran along its western border and started a bloody eight years of warfare. The West no longer supported the government of Iran and backed Iraq with arms sales and military intelligence during the deadly and futile conflict that raged until 1988. Relationships with the West remain difficult today as questions of Iran-sponsored terrorism and assassinations are topics of official communications. The United States maintains a trade embargo against Iran. Calls for United Nations scrutiny of Iranian atomic energy programs have increased in light of concerns with proliferation of nuclear weapons technology and pursuit of weapons of mass destruction. The Persian language, also known as Farsi, is spoken by over half of the population and is written with Arabic script. Turkic dialects make up the next largest language group. The peoples of Persia have long been known for their artistic excellence in handcrafts, architecture, and poetry. Iran has a rich ethnic mix across its landscape. Whereas more than 60 percent of the population is of Aryan origin, large groups of Turkic, Persians, Kurds, Lurs, and Baluchi are found as well. Nearly two-thirds of the population now resides in urban areas where some modernity has taken hold, but the remainder lives in a vast land close to the rhythms of rural life. Iran’s constitution now proclaims that Shia Islam is the official religion. Some 89 percent of the Islamic population of Iran belongs to the Shia branch of ISLAM. The Sunni branch has historically controlled leadership in neighboring Muslim countries. Clerics now dominate politics and almost all aspects of urban and rural life in Iran. Iran is most closely associated with strict Islamic beliefs yet is also the birthplace of the ancient Zoroastrian faith and the more recent Baha’i religion. Iran’s economy is based upon oil production, with over 80 percent of all revenues stemming from this industry. The nation’s overall economy requires more diversification and modernization. Iran’s economy is a mixture of central planning, state ownership of oil and large scale enterprises, village agriculture, and smallscale private trading and service ventures. Economic reforms continue but at a measured pace and with mixed results.